The Switchel Philosopher | What is a proper relationship between a free people and their government? This post is about voting methods at town meeting. See the earlier post About Town Meeting for an introduction to this topic. There are two methods of voting at town meeting: floor vote and Australian ballot. There are three categories of issues decided at town meeting: officers, budgets, and public questions. The general rule in Vermont is that most issues are decided by floor vote. But a town can vote to change to the Australian ballot for some or all issues. And a town can vote to change back to a floor vote. Questions discussed in this post: What are the pros and cons of voting by Australian ballot vs. floor vote? What should citizens think about when deciding how to vote? How does a town change its voting method? 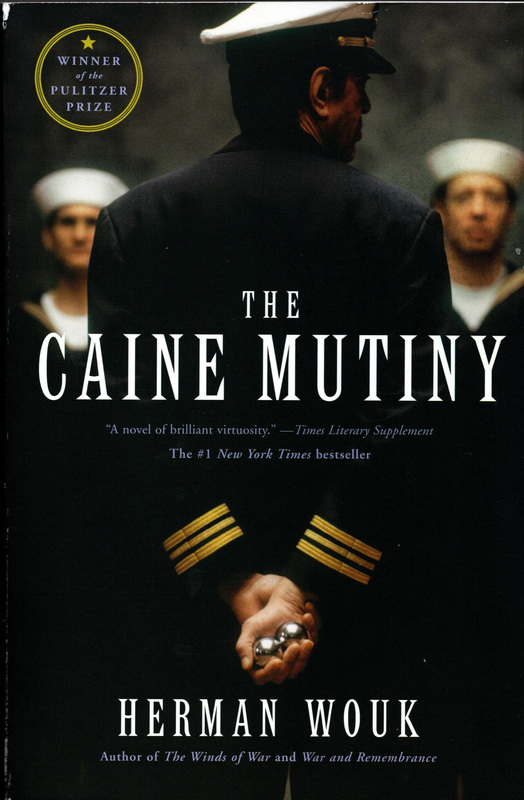 The Caine Mutiny is a novel of historical fiction about World War II by Herman Wouk. It was published, and won the Pulitzer Prize, in 1951. The Caine Mutiny follows the life of Willie Keith from December 1942, one year after Pearl Harbor, to October 1945, shortly after the end of the war. Keith spent most of that time aboard the USS Caine, a World War I destroyer converted to minesweeping duty in the South Pacific. I read this book in high school, and I just re-read it. I thoroughly enjoyed reading this book again, after so many years. It holds many more meanings for me now. This book is about leadership. I now have more perspective about leadership than I did as a teenager. In the course of the novel, the USS Caine has six captains. Each has a different style. Many lines in the book resonate with me as I reflect on the bosses I’ve had, and on the kind of boss that I was. There are leadership lessons in this book that are applicable to our current era of political polarization. No, I’m not suggesting mutiny. Read the book. This book is about love. I now have more perspective about love than I did as a teenager. There are many different kinds of love: in courtship; in marriage (not the same as courtship); within families, especially the bond between parent and child; and between people working together in a common enterprise. This book covers them all. Once I attended a leadership seminar where the speaker said that leadership is love. The speaker was ex-military. This book is about death and chance, both of which I now have more perspective about than I did as a teenager. A half hour of such racking meditation can change the ways of a lifetime. Willie Keith crushing the stub in the ashtray was not the Willie who had lit the cigar. That boy was gone for good. The Caine Mutiny is about “The Greatest Generation.” That phrase had not been coined when the book was published in 1951, nor when I first read the book in the early 1970s. The Greatest Generation was the generation of my parents. I had two aunts whose beaus (and future husbands) served on ships in the South Pacific. I had an aunt who lost a beau in the Battle of the Bulge. (My parents had only sisters, no brothers.) One aunt joined the Navy herself. Those who stayed home, both men and women, also served their country. The government asked my father to work on the farm and produce food. They asked his best friend to fly gliders across the English Channel into occupied Europe; after the war he was the best man at my parents’ wedding and he ran a gas station and car repair shop in Cambridge, perhaps like the one that Carl Hess ran in Arlington. What made them The Greatest Generation? The accident of growing up during The Greatest War in history. The Caine Mutiny is about Big History, as seen through the eyes of a junior naval officer. This book may not resonate with many modern readers, who seem uninterested in history. Social media fuels interest in the gossip of today. But if we fail to learn any lessons from history, we risk repeating its failures – not in exactly the same way, of course; advances in technology will see to that. If, however, you should be interested in Big History, I also recommend Herman Wouk’s later novels which cover the full sweep of World War II: The Winds of War and War and Remembrance. They are magisterial, and like The Caine Mutiny, riveting good reads. There is a passage in The Caine Mutiny that made me smile when I read it a few days ago, as I made the connection with things I learned on our most recent travel adventure last fall (see my other blog The Switchel Traveler). The “mutiny” on the USS Caine occurred in December 1944 during a typhoon when the executive officer believed the ship was in danger of sinking because of the captain’s orders. The executive officer relieved the captain of command. The ship survived, and two months later there was a court-martial. The executive officer was not charged with mutiny, but with “conduct to the prejudice of good order and discipline,” a serious charge carrying a 15 year prison term. After an emotional and dramatic 3-day trial, encapsulated by the image on the book cover above, the executive officer was acquitted. In high school I’m sure I had no idea what “the Fifth Freedom” meant. Now I know. Do not conclude, however, from this little snippet that either the executive officer or the novelist was necessarily a hero. People are complicated. Read the book. The Four Freedoms are very much a force in our world today. Franklin Roosevelt died in April 1945, just before the end of World War II (victory in Europe came in May 1945 and victory in Japan in August 1945). Nevertheless, he laid the groundwork for the creation of the United Nations which would govern post-war relations between countries. 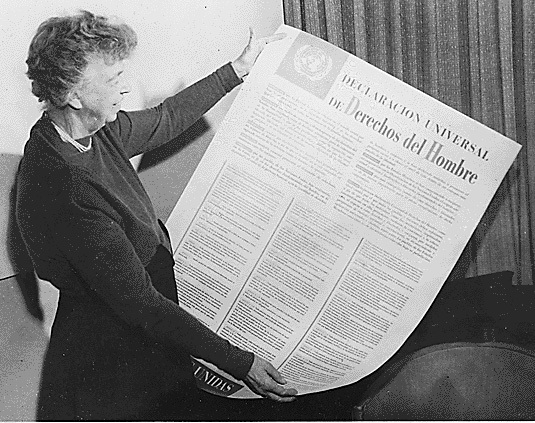 His widow Eleanor Roosevelt ensured that the United Nations recognized the Four Freedoms. The United Nations began operations in October 1945. The challenges were huge. Much of Europe and Asia lay in ruins, devastated by World War II. Displaced refugees numbered in the tens of millions. Only after the war did the full horror of the Holocaust become apparent. And the war did not end the struggle between democracy and communism. 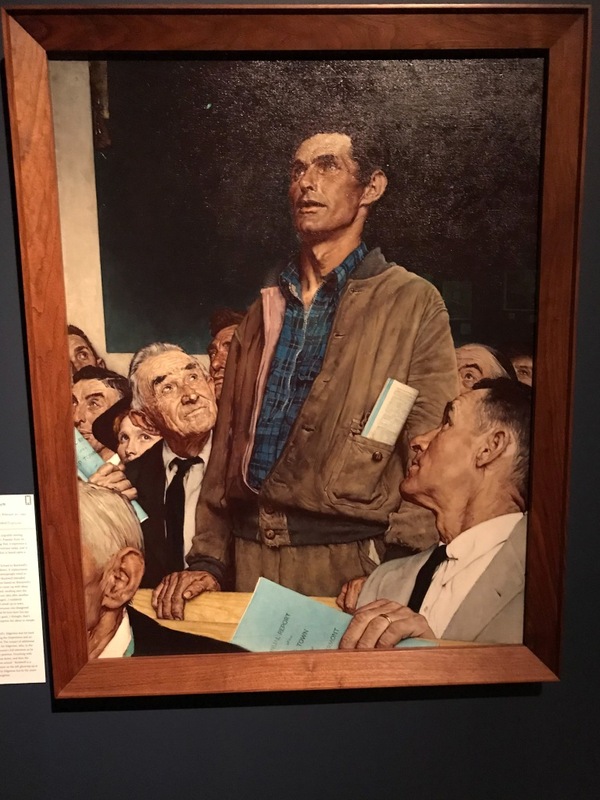 Norman Rockwell’s 1942 painting Freedom of Speech was a huge success. Norman Rockwell’s Freedom of Speech is among the most famous works of American art, arguably as well known as James McNeill Whistler’s portrait of his mother and Emanuel Leutze’s Washington Crossing the Delaware. Freedom of Speech was the only one of Rockwell’s Four Freedoms paintings that was based on an actual event. This post is the story of the event and the painting. 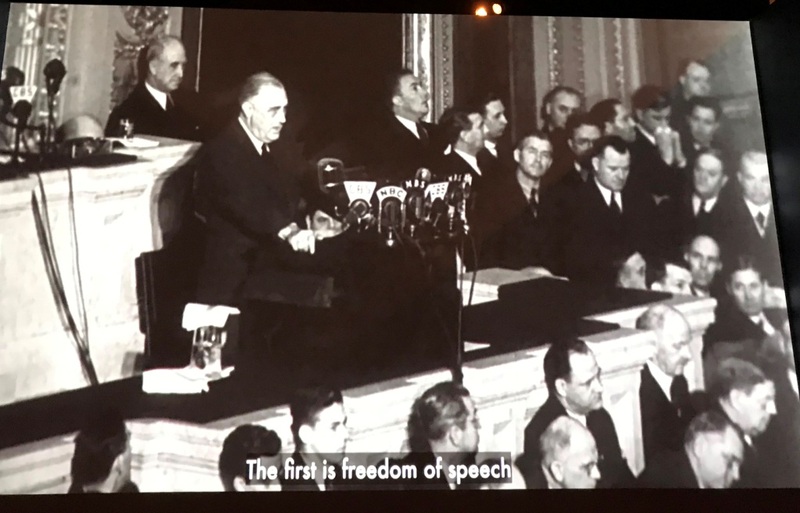 See the post Roosevelt’s Four Freedoms for more discussion of Roosevelt’s speech. 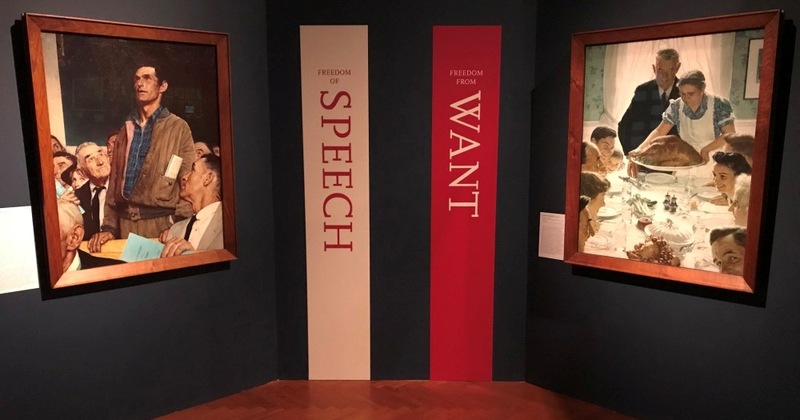 The White House asked writers and artists to promote the Four Freedoms. 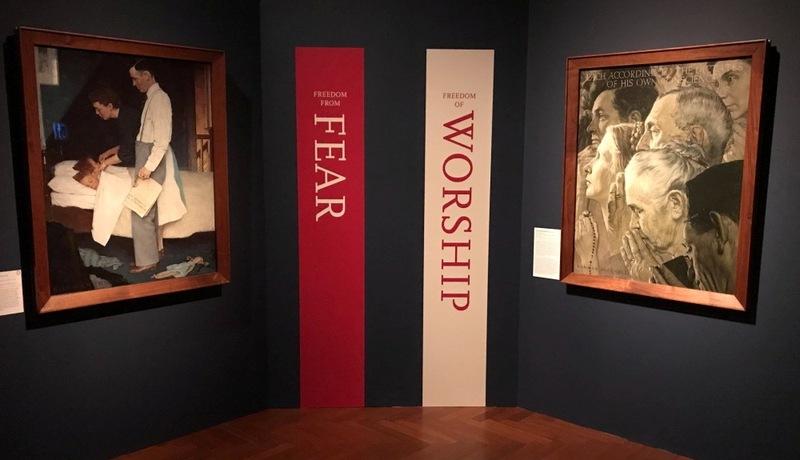 Rockwell, then living in the small town of Arlington, Vermont, was inspired by the Four Freedoms, but he struggled to conceive of a way to illustrate them. In early 1942 he had a flash of inspiration. The photo to the left shows President Franklin Roosevelt giving his annual Message to Congress (what we now call the State of the Union address) on January 6, 1941. This became known as the Four Freedoms speech. Two months earlier, Roosevelt had won re-election to a third term as president. Most of his efforts in his first two terms had been directed at battling the Great Depression. But by now Roosevelt was turning his attention to the raging war in Europe. In 1940 Germany had conquered nearly all of continental Europe. Britain was fighting for survival. President Roosevelt believed that the United States itself would be threatened if Germany defeated Britain, but much of the U.S. public was opposed to involvement in another European war after the costly experience of The Great War 1914-1918 (what we now call World War I). This speech was another step in President Roosevelt’s efforts to build support for U.S. assistance to Britain. Note the timing – January 1941 was eleven months before the U.S. entered World War II following the Japanese attack on Pearl Harbor in December 1941. What does Act 46 mean for democracy? Before considering that general question, let’s review a more specific question: What happened with Act 46 in Cambridge? The short answer is that the town lost control of its elementary school. The photo shows the Cambridge Elementary School on November 30, 2018. My town of Cambridge, Vermont, had its own high school until the 1960s when six towns in northern Lamoille county, including Cambridge, combined grades 7-12 into a single, new facility in Hyde Park: Lamoille Union Middle and High Schools. The towns retained their separate elementary schools. Many towns in Vermont went through a similar process in the 1960s. Towns joined together to form union school districts to afford larger high schools, while retaining town school districts for smaller elementary schools.